Another weekend filled with spiritual activities is planned for the Southwestern Adventist University, starting tonight and continuing through the Sabbath hours. Friday night worship will continue presentations by Elder Ron Halvorsen, guest speaker for Week of Prayer. His message is “None But Jesus,” and will be presented at 8 p.m. in the Keene Seventh-day Adventist Church sanctuary. Afterglow will feature an Agape Feast. It will be held in the Church Fellowship Hall beginning at 9:30. On Saturday morning, Sabbath school begins at 10 in the new student center. Breakfast burritos will be served. Bring your Bibles. University Church will begin at 11:30 a.m. in the sanctuary. Ron Halvorsen will speak on “Adventist Alzheimer’s.” University Church is a student-led service, involving Southwestern students, faculty and staff, on the first Sabbath of every month during the school year. Sabbath afternoon outreach begins at 3. Students, faculty and staff who meet on the library steps will go door-to-door in Keene, giving away little bags of items donated by the Keene Adventist Church, Chisholm Trail Academy, Keene Adventist Elementary School and Southwestern’s Spiritual Life Team. Devin Grady is coordinator for the event. Evensong Service begins at 7 p.m. The University-sponsored reflective service features scripture, prayer, responsive reading and music. 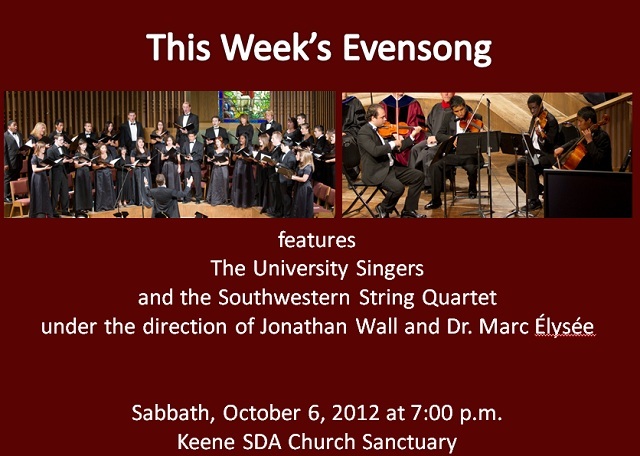 This week’s service will present the University Singers and the Southwestern String Quartet in concert.